Gerald Joseph "Gerry" Mulligan was an American jazz saxophonist, clarinetist, composer and arranger. Though Mulligan is primarily known as one of the leading baritone saxophonists in jazz history – playing the instrument with a light and airy tone in the era of cool jazz – he was also a notable arranger, working with Claude Thornhill, Miles Davis, Stan Kenton, and others. Gerry Mulligan was the undisputed king of the baritone saxophone. He played a significant role in the evolution of jazz as a player, arranger, and composer, working with such legendary figures as Louis Armstrong, Count Basie, Duke Ellington, Billie Holliday, Lester Young, Miles Davis, and Jack Teagarden. High points of his career included the experimental group conceived in the late 1940s with Gil Evans, which led to the landmark recording Birth of the Cool under the leadership of Miles Davis. Having written and arranged 11 pieces for the seminal album, Mulligan then played a role in ushering in the laid-back sound known as West Coast Jazz in the early 1950s; his California-based quartet was renowned for both its lack of a piano and the presence of trumpeter Chet Baker. Mulligan also helped foster renewed interest in big band jazz with outfits that he formed in the 1960s. Although making his reputation first as an arranger, Mulligan eventually earned widespread kudos for his playing. "As an improviser [Mulligan] was slower to develop," allowed The New Grove Dictionary of Music and Musicians, "but [he] then established himself as an outstanding baritone saxophonist, with a style that convincingly wed the harmonic and melodic characteristics of his own generation to a more traditional rhythmic discipline." In fact, Mulligan began improvising at age six. His piano teacher , a nun, told his mother not to waste her money on piano lessons, as he would always improvise a written tune. Mulligan was born in New York, but his father's work as an engineer demanded many job transfers, so the family moved frequently. Gerry began taking piano lessons at age seven, then learned to the play the clarinet. As a teenager he focused mostly on the saxophone. He loved the big band sound and developed an early interest in arranging. "I have a feeling that no matter what era I lived in, a hundred years ago or a hundred years from now, I'd always be interested in orchestration," he told Down Beat in 1989. Mulligan was encouraged in his arranging efforts by his music teacher. After his family moved to Philadelphia, he began selling arrangements to Johnny Warrington, musical director of the WCAU-CBS radio orchestra. In 1944 he arranged for and toured with Tommy Tucker's band, but Tucker lost interest when Mulligan's work became too jazzy. Playing alto sax, Mulligan performed with various dance bands around Redding and Philadelphia. He got his first taste of the limelight as a performer in the mid-1940s when he played baritone sax at Philadelphia's Academy of Music in a concert that showcased some of the hot new jazz performers of the day, including Charlie Parker, Dizzy Gillespie, and Sarah Vaughan. Mulligan performed well enough to earn an invitation from Parker to play in a jam session after the concert. In 1946 Mulligan shifted his base of operations to New York City, where he concentrated on writing and arranging. His skill as an arranger was increasingly defined by his creation of "intricate inner parts, careful balance of timbres, and light swing," as described in The New Grove Dictionary of Jazz. "Mulligan was among the first to attempt to adapt the language of [bebop] for big band," asserted the The Guinness Encyclopedia of Popular Music. At age 19 he was writing, arranging, and sometimes playing for the orchestras of Gene Krupa and Claude Thornhill. His "Disc Jockey Jump," which he wrote for Krupa in 1947, was especially praised. According to the New Grove Dictionary of Music and Musicians, the arrangement for "Disc Jockey Jump" was particularly notable for "pitting a small group against the full ensemble, [foreshadowing] the resourcefulness of ... later, more personal works." The baritone saxophone became Mulligan's main instrument in 1947. His style of play was influenced by Harry Carney, though he ultimately moved away from Carney's mode. In a 1989 issue of Down Beat Mulligan attested, "I never tried to sound like Carney. I couldn't, impossible, but the fact was that any band that used the instrument well, the baritone had an effect on the sound." Mulligan's playing was also influenced by Deane Kincaide of Ozzie Nelson's band, as well as by Ernie Caceres, Serge Chaloff, Leo Parker, and Adrian Rollini. "It's quite possible that as a kid I heard Adrian Rollini [on radio]," he told Down Beat in 1994. "It's quite possible that that influence was stuck in my memory banks even though I wasn't aware of what or who it was." Within a short span of time Mulligan became the top baritone sax player in jazz. "I came to the baritone with an idea of what I wanted to sound like, and then proceeded to try to do it," he explained in Down Beat in 1994. "It meant experimentation until I found a mouthpiece that would do what I want. Once I found that, I was on my way to being able to get out of the horn what I wanted." Mulligan performed in groups with trombonist Kai Winding and other top musicians. He further honed his talent by studying with Gil Evans, whose place was a hangout for arrangers, and by spending time with artists such as John Lewis, Charles Mingus, Lee Konitz, Thelonius Monk, Miles Davis, Jack "Zoot" Sims, and others. A big step in his musical career was playing in the legendary Nonet, which featured Davis, Evans, Konitz on alto saxophone, J. J. Johnson or Winding on trombone, and Lewis on piano, among others. The group spent a remarkable residency at the Royal Roost in New York city in 1948. It was during 1949 and 1950 that Mulligan participated in the nonet's recording of its landmark Birth of the Cool. These sessions resulted in a groundbreaking album that would be elected to the Grammy Hall of Fame in 1982. Heralding a new direction in jazz, Birth of the Cool emphasized improvisation in an orchestra setting. Mulligan's involvement was distinguished by a shift away from fast playing toward a more mellow style. His compositions and arrangements for the this ensemble resulted in heralded performances of songs such as "Jeru," "Boplicity," and "Godchild." Discussing these three songs, Barry McRae said in The Jazz Handbook, "[Mulligan's] gruff-toned but melodically uncomplicated baritone was well featured in all of them and it remained a style that was ageless." Despite his artistic successes, Mulligan had trouble making ends meet during the late 1940s. He decided on a change of scene, and in 1951 he hitchhiked to California. On the West Coast Mulligan worked with his own ten-piece combo, then formed his legendary quartet without piano in 1952. This first quartet included Chet Baker on trumpet and Chico Hamilton on drums. Later members numbered Bob Brookmeyer, Zoot Sims, Art Farmer, and Red Mitchell. Some jazz mythology claims that there was no piano simply because one wasn't available when the group first got together. The pianoless quartet proved to be an innovation that would influence musicians for decades to come. With this combo Mulligan thrived in a lower-volume setting than could groups with piano, which allowed the wind players to showcase themselves in a mellow, two-part counterpoint. The style became known as "cool" jazz; it offered an alternative to the more frenetic bebop of the era. The quartet became a perfect environment for displaying Mulligan's talent at countermelody, his saxophone and Baker's trumpet almost "talking" to each other. Improvisation was a hallmark of the group, and often Mulligan would play in a two-beat, dixieland style that made his solos quite danceable. Touring frequently with the enormously popular Duke Ellington Orchestra, Mulligan's pianoless quartet was a major success. Though Mulligan and Baker did not get along personally, the former often said that playing with Baker was one of the more rewarding experiences of his career. The twosome worked together for only a year, but they generated a number of memorable recordings. Mulligan played with various other groups during the 1950s, continuing to arrange on a free-lance basis. Some of his scores were performed by Stan Kenton's band. In 1960 he formed his Concert Jazz Band, which appeared with considerable fanfare at the famed Village Vanguard in New York City. This 13-piece ensemble also had no piano; it featured a percussion section, five reeds, and six brass instruments. Mulligan's new band "set the tone for big-band jazz into the '60s and continues to be an influence today," stated Mitchell Seidel in Down Beat. Mulligan wrote a number of highly praised scores for the band, managing to keep the sound intimate despite the larger number of instruments. The unit recorded five albums for the Verve label and toured the U.S. with the Woody Herman Orchestra and clarinetist Pete Fountain. Mulligan played in small groups during the mid-1960s. He toured frequently with jazz pianist Dave Brubeck later in the decade. In 1972 his love of trains inspired him to create The Age of Steam, which featured a five-piece rhythm section of piano, guitar, bass, drums, and percussion. He expanded his playing range in the mid-1970s by taking up the soprano saxophone; he indulged his love of dixieland on clarinet. From 1974 to 1977 Mulligan headed a sextet, and in 1978 he formed a 14-piece band that appeared at the Newport Jazz Festival in New York City. Over the next two years he coproduced "The Great Songs" show for the festival along with singer Mel Torme. During this time and until 1988, he toured around the world alternating with the Concert Jazz Band and the quartet. Mulligan put together a 20-piece unit in the early 1980s that featured electronic instruments. But he returned to a smaller format by the middle part of the decade, working with a quintet for one recording in 1986. Proving his versatility yet again, Mulligan began building a repertory of symphonic music for baritone saxophone in the 1980s. His long-standing affiliation with conductor Zubin Mehta led Mehta to invite him to play solo soprano saxophone in a performance of Ravel's "Bolero" with the New York Philharmonic in 1982. Two years later Mulligan completed his first symphonic composition for solo saxophone, entitled "Entente for Baritone Saxophone and Orchestra." The work had its premiere in Italy. Mulligan and a new quartet later appeared with the New York Philharmonic in a highly praised concert series at Lincoln Center. His "Octet for Sea Cliff," a work for chamber orchestra, was released in 1990. By 1992, yet another Mulligan band, a tentet christened "Re-Birth of the Cool," was on the road. The ensemble appeared at the JVC Jazz Festival at New York City's Carnegie Hall, then performed at European jazz festivals. Later that year Mulligan played with other top saxophonists at ceremonies celebrating President (and sax player) Bill Clinton's inauguration. His last quartet featured Ron Vincent on drums, Ted Rosenthal on piano, and Dean Johnson on bass. 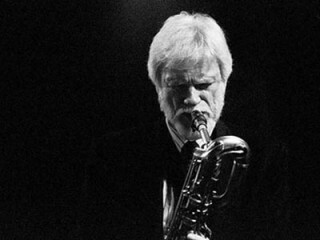 Gerry Mulligan died of complications after surgery for a knee infection at his home in Darien, Connecticut, in 1996. He was 68. Over the course of his long career--he was still touring in 1995 and released a disc, Dragonfly, in October of that year--Mulligan compiled a list of achievements rivaled by few in the world of music. From composing movie scores to arranging works for big bands to playing everything from cool jazz to classical music, he mastered all aspects of the baritone saxophone. His unique musical adaptability never wavered. Record producer Todd Barkan saw Mulligan perform numerous times during his tour of Japan in 1993. He reported in Billboard, "[Mulligan] would play every night with as nonstop a stream of creative improvisations as I have ever heard from any jazz musician. He virtually never repeated himself." - Mulligan Plays Mulligan, Fantasy, 1951. -Gerry Mulligan and His Ten-tette, Capitol, 1953. -California Concerts, Volumes 1 and 2, Blue Note, 1954. -Gerry Mulligan Quartet at Storyville, Pacific Jazz, 1956. -Gerry Mulligan Meets Paul Desmond, Verve, 1957. -Gerry Mulligan and the Concert Band on Tour, Verve, 1960. -The Age of Steam, A&M, 1971. -Walk on the Water, DRG, 1982. -Little Big Horn, GRP, 1983. -Soft Lights and Sweet Music, Concord, 1986. -Symphonic Dreams, Intersound, 1987 Lonesome Boulevard, A&M, 1990. -Dream a Little Dream, Telarc Jazz, 1994. -Re-Birth of the Cool, GRP, 1992. -Gerry Mulligan and the Concert Jazz Band En Concert, Europe 1, 1996. -The Gerry Mulligan Songbook, Pacific Jazz, 1996. View the full website biography of Gerry Mulligan.